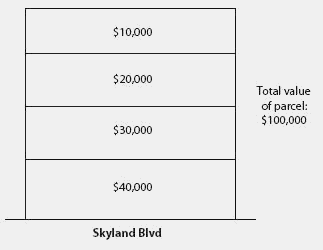 In a tax assessment appraisal,a set of tables that evaluate the relative value of artificially defined slices of property as one proceeds at greater depths from the street frontage.The first, and most simple, table is the 4-3-2-1 table. It describes the front quarter of a parcel as representing 40 percent of the total value,the next quarter as representing 30 percent of the value,the next quarter as representing 20 percent of the value,and the rearmost quarter as representing 10 percent of the value.Commercial appraisers consider the use of depth tables unreliable. Example: Here is an example of a depth table.